A common occurrence for me is that my current project gets a temporary reprieve because there are other, smaller projects I need to finish in order to make the tools I need for the current one. 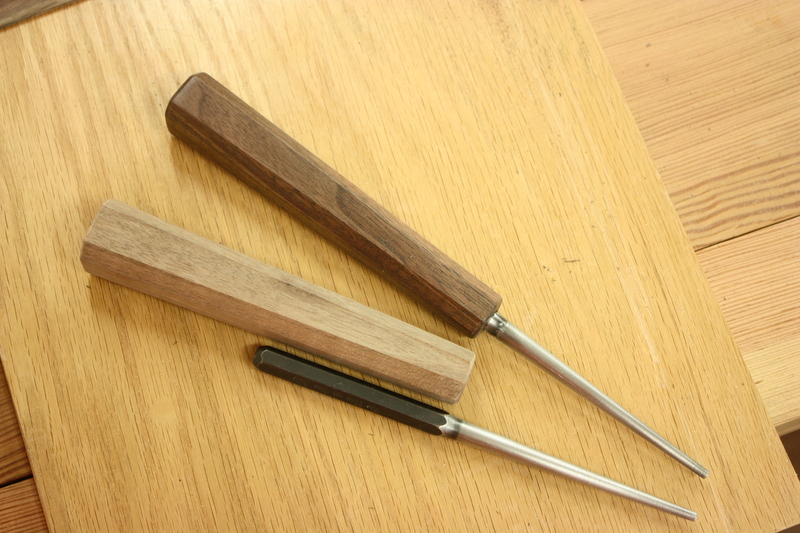 In this case, I want to drawbore the leg joinery for the two workbenches, so I need some drawbore pins. 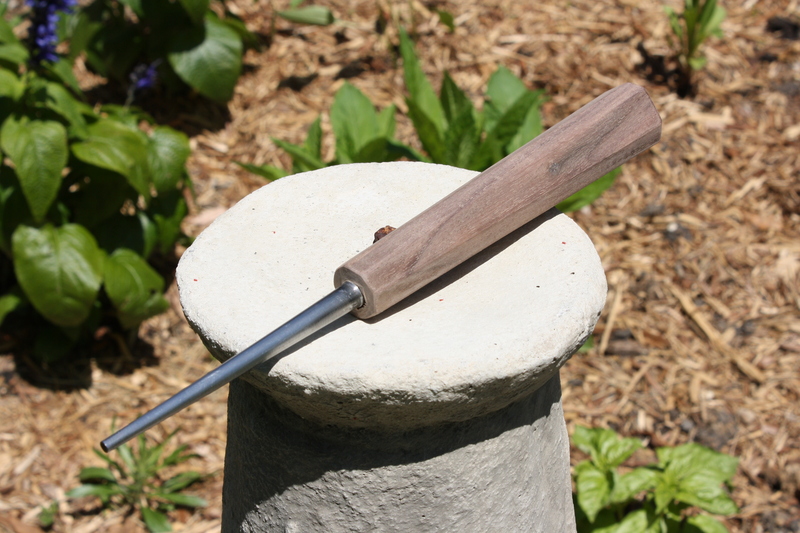 I could quite easily pick up some drawbore pins through an antique tool dealer or from Blue Spruce Tool Works, but buying two sets of them would be expensive. 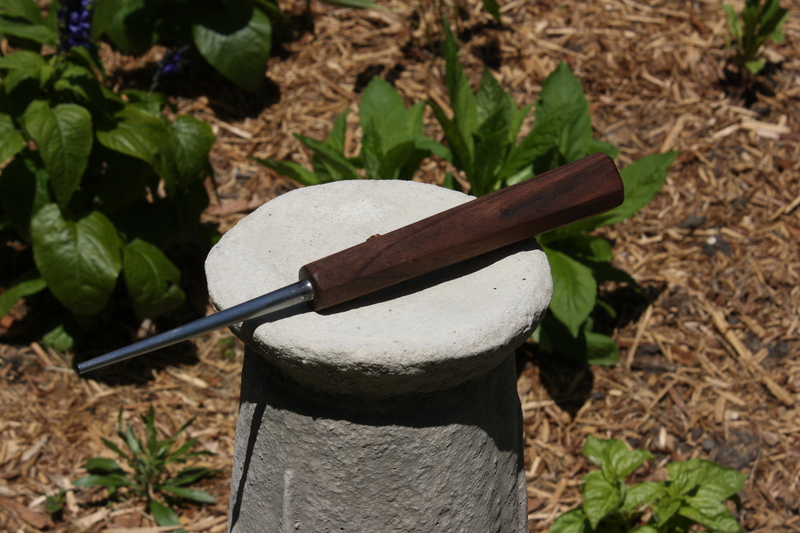 Plus, I’ve wanted to make drawbore pins ever since I read the article about them in one of the first issues of Woodworking magazine. So I decided to give it a go at making them by hand. I went to Sears and picked up two pairs of drift pins (about $15 a pair). I prepped them with 220 grit sandpaper to remove the black coating and quickly roughed some 6/4 walnut to size (1 ¼” x 1 ¼” x 6”) on the newly tuned up bandsaw. 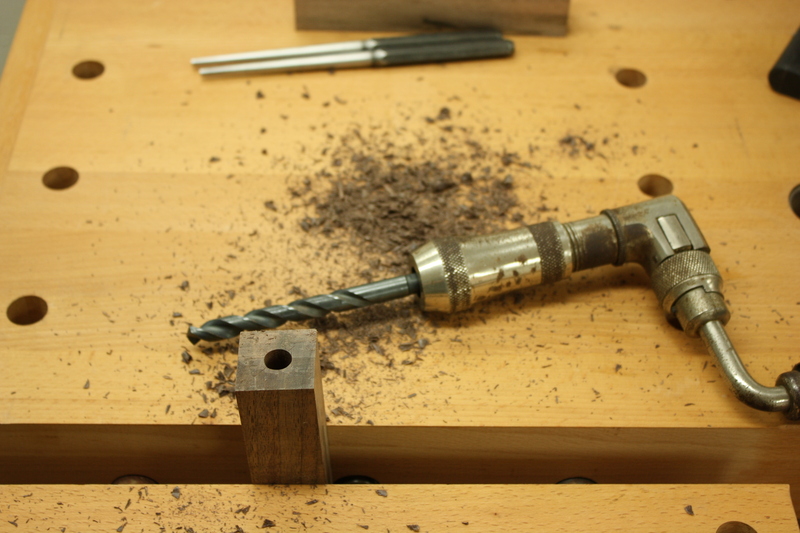 The holes you need to bore into the blanks are a bit unusual – 13/32 for the smaller drift pins and 17/32 for the larger ones. I have a 13/32 bit and picked up a 17/32 bit from a friend. Unfortunately, the latter seemed to have some runout when I chucked it into the drill press, so I’m still trying to figure out what to do for the larger set. In the meantime, I decided to go forward with the smaller ones. As much as I love my old 1960’s Rockwell drill press, it is a bench model and I don’t have enough space under it for 6” of handle blank and another 4” of drill bit. So I made a guide block and bored the hole with a brace. This also gives me a chance to use some of my awesome antique C-clamps, which have acme threads and great details that draw me to them at estate sales, like the grips on the ends of the thread posts. 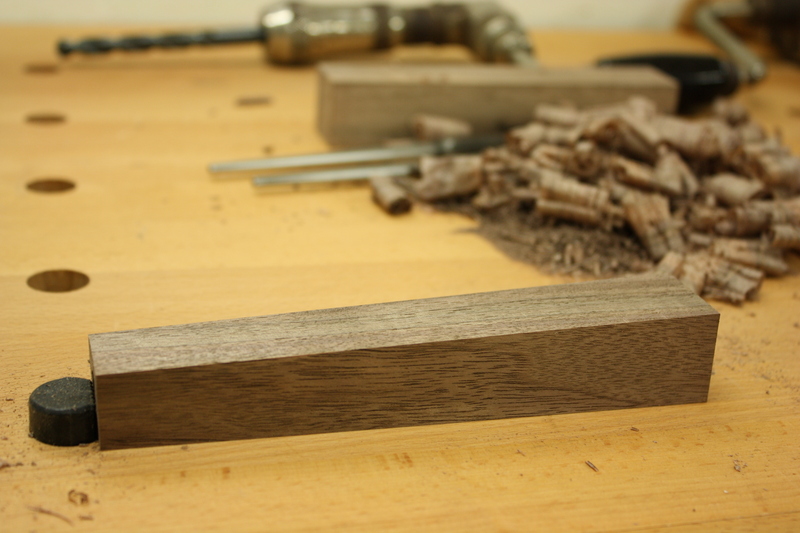 I went back to the bandsaw and tapered the blanks to 7/8” on one end and cleaned up the faces with a block plane. 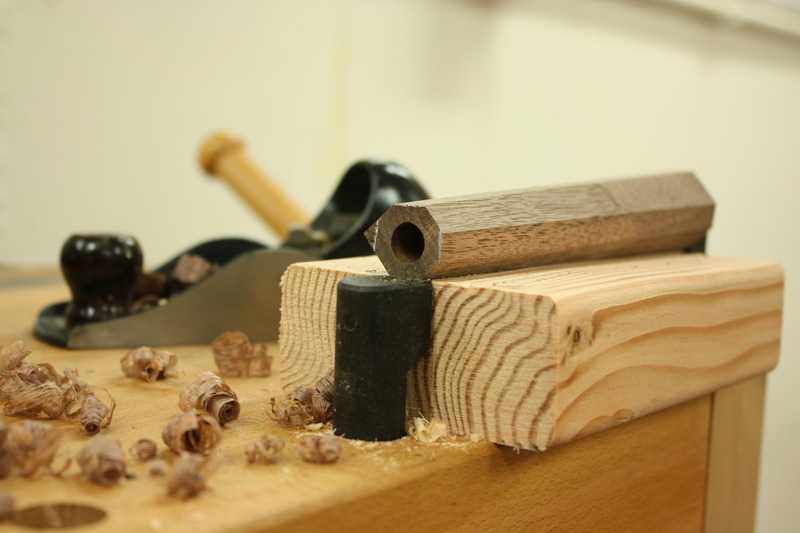 I ran a groove into the middle of a piece of pine to hold the blank steady and planed the chamfers with the block plane. 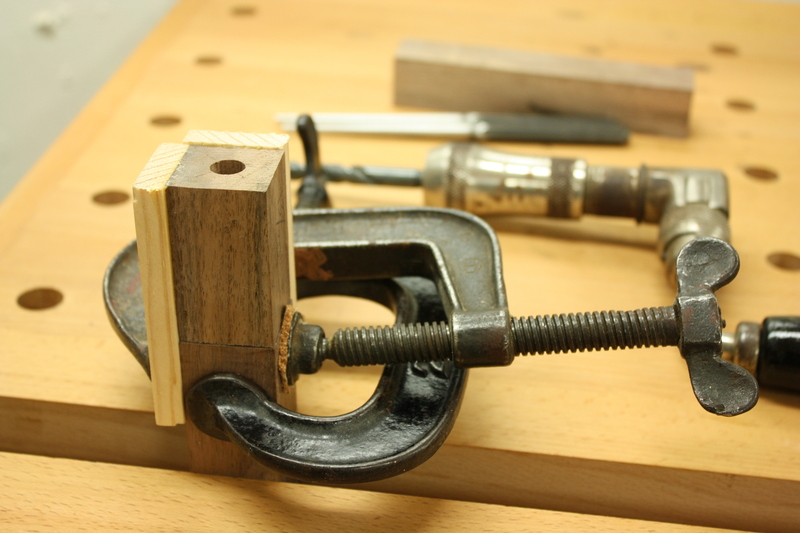 I later remembered I have the chamfer attachment for my Veritas block plane (*sigh*), so I will use that for the larger drawbore pins to make the chamfers more consistent. But I was quite pleased with how well I did free-handing them. 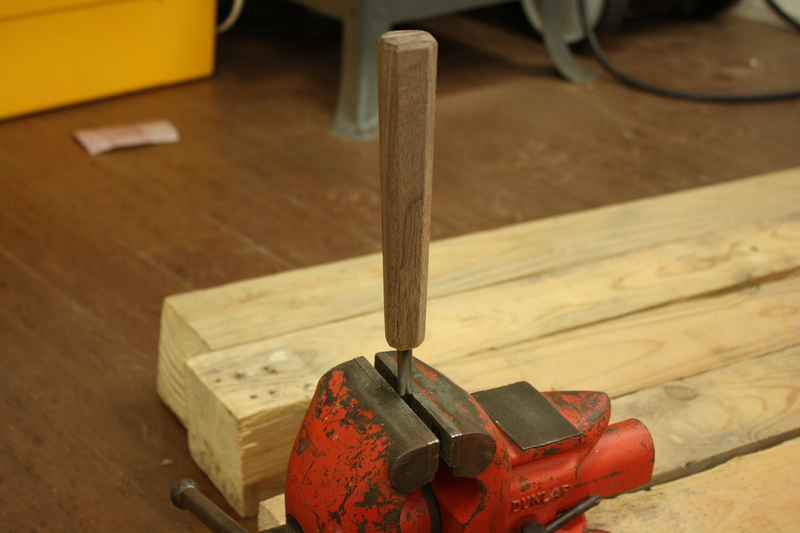 I sanded the endgrain where the hole was bored so I didn’t have to worry about that after the pin was in place, then I clamped the pin in a metal vice and heated it up with a torch. I drove the block on with a mallet. It sank onto the pin like butta. 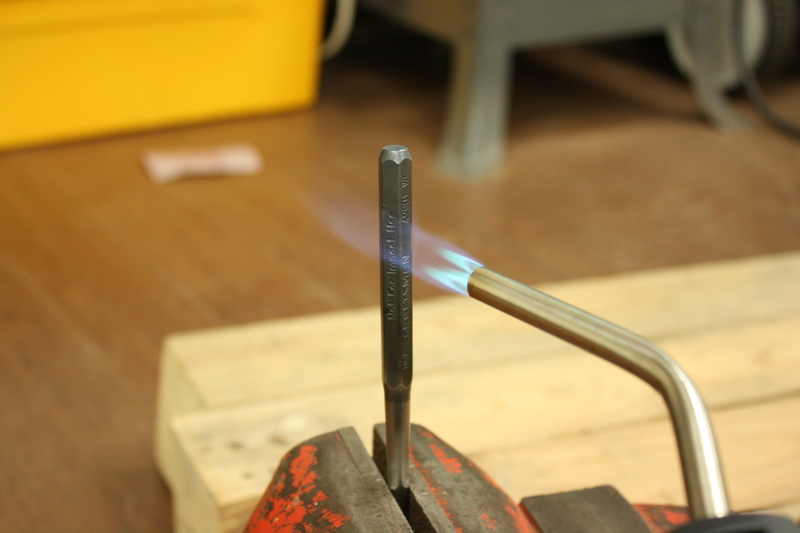 …and ended with a few coats of General’s satin finish Armor Seal. You should have them in pairs, though, so I have one more small drawbore pin to go. Once I figure out what to do about the holes for the larger one, I’ll tackle them, as well. Stay tuned. Thanks, Julio! I’ll take that most excellent complement! Fantastic! This has been on my list of things to do for some time. What drift pins did you get? The smaller pins are marked 5/32. The larger ones are marked 3/16. These numbers are in reference to the size of the tip. I didn’t see any kind of a set when I bought these, so I just bought four individual pins, two of each size. Thank you. I’ll have to pick up a set and give this a try. Happy Memorial Day weekend.